From the no. 3 overall Draft pick to a 7 time All-Star, James Harden discusses his NBA journey. DND for one game (11/13/13) with a bruised left foot … DND three other games (11/23/13-11/27/13) with a sore left foot … did not start at Detroit (12/21/13) due to a sprained left ankle, but made himself available in second half due to injuries … DND for one game (12/23/13) with a sprained left ankle … DND for two games (1/28/14-1/29/14) with a bruised left thumb suffered at Memphis (1/25/14) … selected by the head coaches as a reserve for the 2014 NBA All-Star Game, which marked his second consecutive All-Star selection … named as a replacement starter for the 2014 NBA All-Star Game (2/16/14), totaling eight points (2-6 3FG), five assists, one board and one steal in 23:46 of action … twice named Western Conference Player of the Week for games played Feb. 24-Mar. 2 and Mar. 3-Mar. 9, marking the fifth such honor of his career (10/30/12-11/4/12, 12/31/12-1/6/13 and 3/18/13- 3/24/13) … first Rockets player ever to pick up Player of the Week honors in consecutive weeks in the same season … recorded 35 points (14-16 FT), nine rebounds, five assists, four steals and two blocked shots vs. the L.A. Lakers (11/7/13), becoming the first Rockets player to reach those totals in a game since Hakeem Olajuwon posted 42 points, 13 boards, six assists, five thefts and four blocks back in 1992-93 vs. the L.A. Clippers (4/6/93) … finished with 26 points (7-19 FG, 9-11 FT), 10 assists and three steals in a 110-104 2OT win vs. Toronto (11/11/13) … collected 36 points (9-17 FG, 16-18 FT) and nine boards in a 109- 106 victory at New York (11/14/13) … scored 16 of his 31 points (10-19 FG, 8-13 FT) in the fourth quarter of a 112-106 win at San Antonio (11/30/13) … registered 37 points (12-22 FG, 10-10 FT) and a gamehigh eight assists at Utah (12/2/13) … totaled 34 points (13-22 FG), seven boards and four assists in a 105-83 win vs. Golden State (12/6/13) … finished with 27 points (7-17 FG, 10-11 FT), 10 assists and eight boards vs. Orlando (12/8/13) … netted 16 (6-7 FG, 2-2 3FG, 2-2 FT) of his game-high 28 points in the fourth quarter of a 111-98 win at San Antonio (12/25/13) … became the first player in NBA history to register at least 27 points on two or fewer field goals made (2-9 FG) vs. Memphis (12/26/13), finishing a career-best 22-of-25 from the stripe and tying the Rockets single-game record for free throws made (22-27 FT by Sleepy Floyd on 2/3/91 vs. Golden State) … registered 38 points (12-26 FG, 5-11 3FG, 9-10 FT) and a season-high 10 rebounds vs. Sacramento (12/31/13) … racked up 37 points (10-19 FG, 5-10 3FG), seven rebounds and six assists in a 102-100 win vs. New York (1/3/14), which included a perfect 12-of-12 outing form the free throw line … scored 38 points (14-23 FG, 8-11 FT) and made five steals in a 113-99 win vs. the L.A. Lakers (1/8/14) … became the first Rockets player to score at least 37 points in three consecutive games since Olajuwon back in 1994-95 (three games: 42 on 12/29/94, 37 on 12/30/94 and 41 on 1/3/95) … made a season-high three blocks in a 104-92 win at Boston (1/13/14) … recorded 22 points (7-16 FG) and five steals vs. Milwaukee (1/18/14) … collected 10 points (5-6 FT) and a career-high 13 assists vs. Memphis (1/24/14) … played in his 120th game with Houston vs. Phoenix (2/5/14), scoring 23 points on 12-for-12 from the foul line to become just the third player to score at least 3,000 points in his first 120 games played with the Rockets: Elvin Hayes (3,320), Tracy McGrady (3,056) and Harden (3,022) … scored the deciding bucket with seven-tenths of a second left in a 113-112 win vs. Washington (2/12/14), finishing with 35 points (8-14 FG), six boards and six assists, while matching his career best for most free throws made without a miss (16-16 FT) … collected a game-high 29 points (10-18 FG, 5-7 3FG), 11 assists, six boards, four steals and one block in a 134-108 win at the L.A. Lakers (2/19/14) … recorded 39 points (14-27 FG, 8-10 FT) at Golden State (2/20/14) … led Houston with a season-high 43 points (11-20 FG, 6-9 3FG, 15-16 FT), eight dimes and three thefts in a 129- 103 win at Sacramento (2/25/14), joining Olajuwon and Clyde Drexler as the only Rockets to record at least 40 points, eight assists and three steals in a game since 1985-86 … scored 22 of his points (7-10 FG, 2-2 3FG, 6-7 FT) over the opening 12 minutes at the Kings (2/25/14), tying for the most first-quarter points in Rockets history (22 by Kevin Martin on 12/11/10) … finished with 20 points (7-16 FG), a game-high 12 assists and three steals vs. Detroit (3/1/14) … posted 21 points (9-15 FG) and another game-high 11 assists in a 106-103 win vs. Miami (3/4/14) … was the first time in his career to record 10-plus assists in consecutive games … went for 25 points (8-11 FG, 2-3 3FG, 7-7 FT) in the second half to lead the Rockets to a 101-89 come-from-behind win at Orlando (3/5/14), finishing with 31 points (11-19 FG, 7-7 FT) and six assists … registered 41 points (12-28 FG, 10-11 FT), a season-hightying 10 rebounds, six assists and a season-best six steals vs. Portland (3/9/14), which included matching his career high in 3-pointers made (7- 12 3FG) … also nailed a 3-pointer with 8.8 seconds left in regulation to even the game at 106-106 and force OT with the Blazers … became just the fourth player since the NBA started tracking steals in 1973-74 to have at least 40 points, 10 boards, six assists and six steals in a game: Julius Erving (1977), Larry Bird (1982) and Michael Jordan (1989) … was his second 40-point outing of 2013-14 (fifth career) … led the Rockets with 30 points (7-16 FG, 5-12 3FG, 11-12 FT) at Miami (3/16/14) … topped Houston with 37 points (9-15 FG, 5-8 3FG, 14-14 FT), 10 assists and four steals in a 118-111 win at Cleveland (3/22/14) … totaled 31 points (11-19 FG, 4-7 3FG) and five assists in a 100-89 win at Charlotte (3/24/14) … posted 26 points (9-17 FG, 3-8 3FG, 5-6 FT), 10 rebounds and 10 assists vs. Philadelphia (3/27/14), which marked the second triple-double of his career … finished with 32 points (9-22 FG, 11-13 FT), seven rebounds and six assists vs. the L.A. Clippers (3/29/14) … netted 26 points at Brooklyn (4/1/14), tying his career best for most free throws made without a miss (16-16 FT) … led all scorers with 39 points (9-22 FG, 4-8 3FG, 17-20 FT) in a 111-107 win vs. Oklahoma City (4/4/14), adding nine rebounds, seven assists and two steals … finished with 32 points (9-23 FG, 11-12 FT), 10 assists and four steals in a 130-125 OT win vs. Denver (4/6/14), hitting the game-tying 3-pointer with 7.1 seconds left to force OT … scored a game-high-tying 33 points (10-15 FG, 3-6 3FG, 10-11 FT) vs. the L.A. Lakers (4/8/14) … picked up the 14th 20-point, 10-assist game of his career … also had a game-high 12 assists vs. the L.A. Lakers (4/8/14) … scored a team-high 33 points (7-14 FG, 4-5 3FG, 15-19 FT) at Minnesota (4/11/14) … racked up 33 points (10-22 FG, 3-8 3FG, 10-10 FT) vs. the Pelicans (4/12/14) … also marks his 14th double-double of the season … overall, was his 24th 30-point performance of the season (49 career). 2012-2013: Named to the 2012-13 All-NBA Third Team, marking his first career All-NBA Team selection … just the seventh player in Rockets history to earn All-NBA recognition … had one of the greatest statistical seasons in team history in his first campaign with Houston … averaged 25.9 points, 4.9 rebounds and 5.8 assists in 78 games (78 starts) … ranked fifth in the NBA in points per game (25.9), second in free throws made (674) and first in free throw attempts (792) … also ranked seventh in the NBA in steals per game (1.82), notching a team-high 21 games with at least three steals … topped the Rockets (or tied) in scoring on 59 occasion and led the squad in assists 38 times … became just the fifth player in team history to reach 2,000 points in one campaign (2,023 points) … DND for one game (12/10/12) with a sprained right ankle that he suffered vs. Dallas (12/8/12) … DNP for one other game (2/13/13) with a right ankle sprain that he suffered at Golden State (2/12/13) … also DND for two games (3/30/13-4/1/13) with a sore right foot … recorded two 40-point games and netted a career singleseason best 23 30-point performances (Rockets record: 16-7) … also had a career single-season high 65 20-point outings … registered the first nine doubledoubles of his career (Rockets record: 7-2) … surpassed Moses Malone’s team mark for free throws made in a season (630 FTM in 1981-82), joining Malone as the only two Rockets players to ever reach 600 free throws made in a single season … joined Gilbert Arenas (2005-06 and 2006-07), Kobe Bryant (2005-06 and 2007-08) and Jerry Stackhouse (2000-01) as the only four players in NBA history to record at least 600 free throws made and hit 150 or more 3-pointers in one season … named NBA Western Conference Player of the Week three times in his career with all coming in 2012-13 (Oct. 30-Nov. 4, Dec. 31-Jan. 6 and Mar. 18-Mar. 24) … joined Tracy McGrady (four times in 2004-05) and Hakeem Olajuwon (three times in 1992-93) as the only Rockets to ever capture Player of the Week honors three or more times in one season … named as a reserve for the 2013 NBA All-Star Game, marking the first time in his career to be selected as an All-Star … recorded 15 points (6-13 FG, 3-8 3FG), six rebounds and three assists in a 143-138 win by the West in the 2013 NBA All-Star Game in Houston (2/17/13) … also competed in the 2013 Sears Shooting Stars as part of State Farm All-Star Saturday Night (2/16/13) … coached the West team to a 58-38 win at the 2013 Sprint NBA All-Star Celebrity Game (2/15/13) … became the first-ever NBA player to score 37 or more points while registering a double-digit assist total in his team debut, posting 37 points (14-25 FG, 4-10 3FG, 5-6 FT), a career-high 12 assists, six rebounds, four steals and one block in a 105-96 win at Detroit (10/31/12) … just the fourth NBA player in the last 25 years to post those totals in a single game and matched the third-highest point total for any NBA player in his team debut (most for Rockets debut) … totaled 45 points (14-19 FG, 2-4 3FG, 15-17 FT) at Atlanta (11/2/12) … his 82 total points were the most scored by a player in his first two games with a team in NBA history, surpassing the previous mark held by Wilt Chamberlain, who scored 79 points in his first two career games with the Philadelphia Warriors in 1959 … left the game (upper respiratory distress) in the second quarter at Utah (11/19/12) … led the Rockets with 33 points (7-15 FG, 3-5 3FG) and a game-high nine assists in a 131-103 win vs. New York (11/23/12), which included going a perfect 16-of-16 from the free throw line … had a game-high 24 points (9-19 FG, 4-8 3FG) and a career-high-tying 12 assists vs. Toronto (11/27/12) … recorded 15 points (9-11 FT) and 10 rebounds vs. the L.A. Lakers (12/4/12) … topped Houston with 39 points (10-17 FG, 4-9 3FG, 15-16 FT) and nine assists vs. Dallas (12/8/12), notching 30 points (8-10 FG, 3-4 3FG, 11-11 FT) in the first half alone … led Houston with 28 points (9-18 FG) and 10 rebounds at New York (12/17/12) … totaled 33 points (7-12 FG, 17-18 FT) and seven assists vs. Philadelphia (12/19/12) … collected 31 points (9-13 FG, 3-3 3FG, 10-12 FT), eight assists and three steals vs. Memphis (12/22/12), despite sitting out the entire fourth quarter of a 121-96 win … netted 30 points (11-22 FG) at Minnesota (12/26/12), which included scoring 17 fourth-quarter points to lift the Rockets to an 87-84 win … scored a game-high 33 points (10-22 FG, 10-13 FT) to go with seven assists at San Antonio (12/28/12) … collected 29 points (6-17 FG, 14-15 FT) and a career-high seven steals at Cleveland (1/5/13) … finished with 31 points (11-19 FG, 8-8 FT), nine assists and six boards vs. the L.A. Lakers (1/8/13) … netted 25 or more points in 14 straight games (12/16/12-1/9/13) to set the franchise record previously held by Malone at 13 in a row (1/26/82-2/23/82) … had a career-best four blocks at Indiana (1/18/13) … recorded a streak of 20-plus point games in a career-high 22 consecutive outings (12/7/12-1/16/13), which ranks as the fifth longest such streak in Rockets history … led the Rockets in scoring outright (no ties) in 20 consecutive games (12/12/12-1/16/13), which stands as the second longest streak in team history (23 games by Malone from 2/26/82-4/11/82) … totaled career highs in free throws made (19) and attempted (21) in a 100-94 win at Charlotte (1/21/13), which included going 10-of-10 from the charity stripe in the fourth quarter alone … recorded a career-best streak of 36 consecutive free throws made (1/21/13-1/26/13) … registered the first tripledouble of his career with 21 points (6-11 FG, 8-9 FT), 11 rebounds and 11 assists vs. Charlotte (2/2/13) … led the Rockets with 36 points (10-16 FG, 4-7 3FG, 12-13 FT), a career-best 12 rebounds, seven assists and three steals at Miami (2/6/13), becoming the first Rockets player to amass such totals in a single game since Olajuwon (3/23/96 on vs. Minnesota) … finished with a game-high 35 points (13-16 FG, 4-5 3FG, 5-6 FT), 11 assists and seven boards vs. Portland (2/8/13), which included going a perfect 8-of-8 (2-2 3FG, 2-2 FT) from the field for 20 points in the first half alone … tallied a game-high 30 points (10-20 FG, 8-11 FT) at Sacramento (2/10/13), giving him 30-plus points in a career-best three straight games (2/6/13-2/10/13) … registered a career-high 46 points (14-19 FG, 11-12 FT), seven rebounds and six assists in a 122-119 win vs. Oklahoma City (2/20/13), which included setting his career best in 3-pointers made (7-8 3FG) … led all Western Conference scorers in the month of Feb. 2013 (28.7 ppg) and was third in the West in steals per game (2.10 spg) … hit a perfect 16-of-16 from the free throw line at Dallas (3/6/13), finishing with 28 points (5-17 FG) and nine assists … scored 20 points (3-17 FG, 11-14 FT) and dished out 11 assists at Golden State (3/8/13) … registered 38 points (11-17 FG, 9-12 FT) and eight assists at Phoenix (3/9/13), which included matching his career high in 3-pointers made (7-10 3FG) … had at least one theft in a career-best 28 straight games (1/9/13-3/9/13), which was the longest such streak by a Rockets player since Steve Francis (29 from 2/9/04-4/9/04) … posted 37 points (8-16 FG, 5-10 3FG, 16-18 FT), eight assists and seven boards vs. Minnesota (3/15/13), including a 25-point second half in a 108-100 comeback win over the Wolves … posted 21 points (6-16 FG, 6-6 FT), 10 rebounds, eight assists and three steals vs. Golden State (3/17/13) … scored a game-high 29 points (5-14 FG) vs. Utah (3/20/13) off a 17-of-18 performance from the free throw line … finished with 29 points (6-16 FG, 15-17 FT), nine rebounds, six assists, two steals and two blocks vs. San Antonio (3/24/13), hitting a shot with 4.5 seconds left to lift the Rockets to a 96-95 win over the Spurs … racked up 33 points (11-21 FG, 4-9 3FG) in a 116-98 win at Portland (4/5/13) … went 10-for-10 from the stripe at Denver (4/6/13) to surpass Malone’s Rockets record for free throws made in a season … finished with 33 points (9-21 FG, 13-14 FT), six boards, six assists and three thefts vs. Phoenix (4/9/13), as goaltending was ruled on his 3-point attempt as time expired to give the Rockets a 101-98 win … registered 30 points (7-24 FG, 5-10 3FG, 11-14 FT) vs. Memphis (4/12/13) and totaled 30 more points (8-25 FG, 10-12 FT) at the L.A. Lakers (4/17/13). 2011-2012: Averaged 16.8 points, 4.1 rebounds and 3.7 assists in 62 games (two starts) with Oklahoma City … received the 2011-12 NBA Sixth Man Award (received 584 of a possible 595 points, including 115 of a possible 119 first-place votes) … was the leading bench scorer in the NBA with a 16.8 point per game average (min. 40 games off the bench) … scored in double-figures in all but four of his appearances during the season … scored 20-plus points on 15 occasions (Thunder record: 14-1), including two 30-point efforts (record: 2-0) and one 40-point outing … scored a season-high 40 points (12-17 FG) at Phoenix (4/18/12), becoming the first NBA player in a reserve role to score 40 points since Dallas guard Rodrique Beaubois (3/27/10) … also had 33 points (11-16 FG) vs. Charlotte (3/10/12) … had a season-high nine assists at Dallas (2/1/12). 2010-2011: In his second season with Oklahoma City, came off the bench to score 10-plus points in 27 of the final 29 games of the season (included a season-long 18-game streak 2/15/10-3/25/11) … Thunder went 4-1 with him in the starting lineup and 7-3 when he scored 20-plus points … scored 10-plus points on 54 occasions, including a season-high 26 points (8-12 FG) vs. Phoenix (3/6/11). 2009-2010: Named to the NBA’s All-Rookie Second Team as a member of the Thunder … recorded the fourth highest 3-point percentage in NBA history (.375) for a player under the age of 21 (min. of 150 attempts) … posted a season-high 26 points vs. Golden State (12/7/09) … connected on seven straight 3-point field goals over two games, recording the most consecutive 3-point makes by a rookie since Houston guard Michael Dickerson made eight straight (5/4/99-5/5/99) … ranked sixth in his rookie class in 3-point field goal percentage (.375; 93-248 3FG) and shot .808 from the free throw line, which was seventh among NBA rookies (min. 30 attempts). Drafted by Oklahoma City with the third overall pick in the 2009 NBA Draft … acquired by the Rockets along with Cole Aldrich, Daequan Cook and Lazar Hayward from the Thunder in exchange for Kevin Martin, Jeremy Lamb and three future draft selections on Oct. 27, 2013 … signed a multi-year contract extension with Houston on Oct. 31, 2013. A two-time First-Team All-Pac 10 selection at Arizona State … as a sophomore, was named an AP First- Team All American and the Pac-10 Player of the Year … was the third Sun Devil in school history to earn Pac-10 Player of the Year honors, joining Eddie House and Ike Diogu … joined Jason Kidd and Mike Bibby in becoming just the third sophomore in league history to win the award … became just the fifth player in Pac-10 history to lead the league in scoring (20.1 ppg) and steals (1.69 spg) when he did in 2008-09. 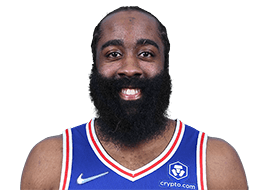 Born James Edward Harden Jr. on Aug. 26, 1989, in Bellflower, California … lists his mother, Monja Willis, as the biggest influence in his life … supports the community through his James Harden Foundation … joined his mother and other family members in hosting five Houston area families on a shopping spree at Super Target on Dec. 21, 2012 … families were selected by Houston Children’s Charities because of their need for assistance during the 2012 holiday season … hosted the James Harden Basketball Camp in 2013 in The Woodlands, Texas … led Artesia High School to a 33-2 record in his senior year and second straight state title, as well as earning Trophy-Case Player of the year honors … went to the same high school that produced Ed and Charles O’Bannon and Jason Kapono … enjoys playing video games … favorite food is chicken pasta.